On Sunday, a couple of friends and I went to the beach. I played around in the surf, used a pal's boogie board, and got thorougly thrown around by the strong waves. At one point, I got hit by a breaking wave that took all my control -- I decided to go limp and let it carry me to the beach. The sensation made me feel like a jellyfish. 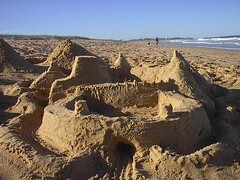 Anyhow, we built a sand castle -- the best one ever, I might add. It is called the castle "Caselu" (カセル) in light of our attempts at drawing Hiragana in the sand. (Only one of us could write Japanese, and she is an expert). Link to more photos of the engineering feat. Link to all my Australia photos.